(Natural News) Coffee has become a part of many people’s lives. However, coffee isn’t the safest source of an energy boost. If it’s a healthy energizing drink that you want, then yerba mate is the answer. Previous studies have shown that too much coffee can cause side effects, such as addiction, heart palpitations, and panic attacks, since it has a lot of caffeine. Although yerba mate also has caffeine, it is considerably less than coffee’s. Moreover, even with its lower caffeine levels, yerba mate can provide the same energy boost as coffee. Boosts energy – As previously mentioned, yerba mate provides an energy boost similar to that of coffee but without the side effects. Because of this, it’s extremely useful for people suffering from fatigue. Enhances mental function – Aside from caffeine, which is known to enhance brain function, yerba mate also contains theobromine and theophylline. These compounds act as brain stimulants that can enhance memory, mood, and alertness. Yerba mate has also been shown to stimulate dopamine production, which enhances mood and productivity. Provides nutrients – Yerba mate contains various vitamins and minerals that are needed by the body. In addition to this, yerba mate has bioactive compounds that exhibit antioxidant properties. Regulates the immune system – This property of yerba mate can be attributed to the presence of saponins and polyphenols. These compounds prevent the immune system from overreacting to both foreign and innate substances. Diseases like allergies, inflammatory bowel disease, multiple sclerosis, rheumatoid arthritis, and diabetes can be avoided with proper regulation of the immune system. In addition to this, yerba mate contains vitamins C and E, as well as selenium and zinc, which keep colds and flu away. Promotes weight loss – Previous studies have shown that yerba mate can help a person lose weight by reducing appetite, as well as increasing metabolism and usage of stored fat. Since yerba mate increases metabolism, people who drink it and exercise will find that they lose more weight even with their regular exercise routine. Improves digestion – Yerba mate has natural antibacterial properties against E. coli. Aside from this it can also eliminate intestinal parasites with its saponin content. Studies have also shown that yerba mate can increase bile production, which helps in the digestion of food. Increases bone strength – Drinking yerba mate can increase bone density, even if caffeine is normally associated with bone mineral loss. This increase in bone density is observable even in people who do not exercise. In previous studies, regular consumption of yerba mate by postmenopausal women reduced the risk of osteoporosis and increased bone density. Keeps the heart healthy – Antioxidants in yerba mate protect a person from potential heart failure, irregular heartbeat, and low blood pressure. Aside from this, theobromine in yerba mate also supports better blood flow by relaxing the blood vessels. There have also been studies that have observed yerba mate’s ability to reduce harmful cholesterol and increase beneficial cholesterol. Lowers blood sugar – People who drink yerba mate experience significant improvements in insulin sensitivity, which is usually impaired in diabetic individuals. 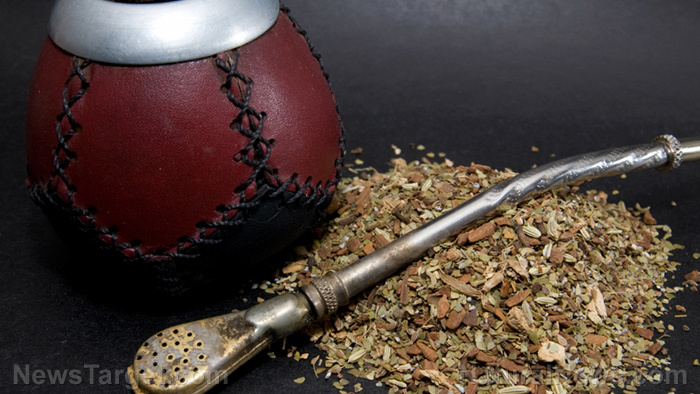 Learn more about the health benefits of yerba mate by visiting Healing.news today.